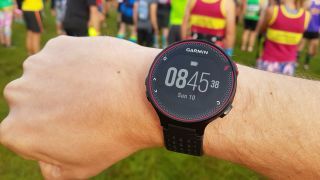 If you're looking to buy a new Garmin running watch, you may find it worth waiting for a while - new rumors suggest the company is readying a Forerunner 245 Music. It's expected to be a follow up to the Garmin Forerunner 235, which is one of the company's more affordable watches that is still capable of tracking lots of running metrics. A new photo shared by Gadgets and Wearables shows what we expect to be a press image of the watch, which looks similar to the Forerunner 645 without a metal bezel. Why not try best fitness tracker? The rumors suggest there will be two models of the new Forerunner 245. One of those will feature music integration, while the other won't and will likely be cheaper because of it. While we don't currently know the exact specs for the music-toting variant, we'd expect a similar affair to the Garmin Forerunner 645 Music with storage for up to 500 songs as well as Spotify and Deezer integration. You can see the photo of the watch below, but it doesn't share all that much information on the new spec of the watch. The photo itself doesn't tell us all that much about the watch apart from that it will look similar to the Forerunner 645 and Forerunner 235. The source of the image suggests it'll have the same dimensions as the Forerunner 645 (that's 42.5 x 42.5 x 13.5 mm) as well as similar battery life. If that's the case, you should find it lasts for around a week with day to day usage and up to 5 hours when using GPS. The Firstbeat metrics you'll be tracking with this device are expected to be wider than on previous generations of the watch, but we don't currently know what exact stats it'll be able to monitor. All of this is rumored for now, but with the Forerunner 245 Music passing FCC certification last week we'd expect to hear more about it from Garmin in the next couple of months.